With Layaways, you can allow your customers to put down a deposit on any product and pay little-by-little. When they are done paying fully, they can receive the product. 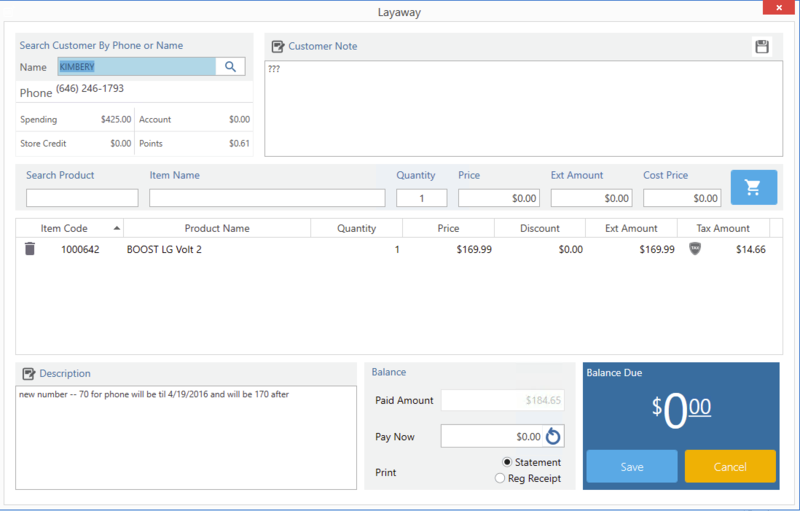 With the Layaway module, you are able to keep track of all payments received from the customers and once they are done paying fully, you can close the layaway. Click on the Layaway icon. Select the layaway from the list of layaways. Click on the deliver/ close icon from the options menu. Enter the IMIE/ Serial number of the device in IMEI field. Select the activation type and click save. Click on the Trash bin icon from the options. Note: You can only delete layaways from the current working shift. Click on the refund icon from the options menu. Enter the restock amount or the restock percentage amount you charge for the refund in the appropriate fields. Select the payment out information. ( previous used, register or terms ). Click on the payment icon from the options menu. Enter any customer notes if necessary. Enter the payment amount in the pay now field.